Your client may find themselves with a financial interest in a third party business associate, who is not insured in their favor. If an untimely death or disability were to happen to the uninsured third party, your client could face a significant financial setback. Despite the reasons the third party has for being uninsured, your client needs to feel secure should the unthinkable happen. 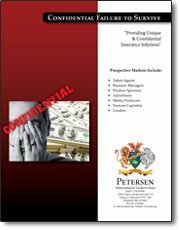 For cases such as this, Petersen International Underwriters provides Confidential Failure to Survive Insurance. Q: What is the minimum benefit and the maximum benefit available? A: $100,000 is the minimum and the maximum is $20 million. Often there is even higher capacity available in the market, based on the particular case. Q: Can I purchase coverage on my spouse? A: No, however in a divorce situation whereby alimony or child support has been ordered by the judge then coverage would be available. Q: How long does underwriting take? A: Normal underwriting is only 2-3 days. Q: Can I purchase coverage on anyone? A: No, the coverage can only be purchased when there is a contractual financial justification for the insurance. This type of insurance coverage is commonly used for venture capital deals, movie productions, talent managers and business agents where an individual has a contractual financial interest in a third party. In order to keep the policy confidential and uncomplicated there is no need for a medical examination and the application process is quick and concise. Not everyone is cooperative when it comes to applying for insurance. Now you can help your client secure coverage with PIU’s Confidential Failure to Survive Insurance plan.